Step 1 The US Government has this great web page that will calculate your necessary declination adjustments on-line. First, just type in your zip code and click on the Get Location button. Once you do that, the page will refresh, and your longitude and latitude will be filled in automatically. Today's date is also automatically entered into the date field, but you can change it if you like. Click here to open this on-line declination correction tool. 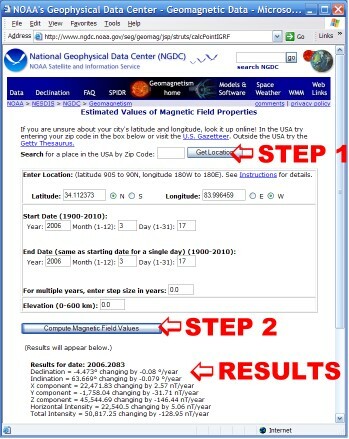 Step 2 Next, just click on the Compute Magnetic Field Values button at the bottom of that page. Your results will quickly appear just below that button at the bottom of the page. You will need to scroll down that page so you can see the results below the Compute button. Results You will see your declination value at the top of this magnetic values list. Remember, Easterly declination values are represented as positive numbers and Westerly declination values are represented as negative numbers. Now you may want to go to our next learning page, so you can learn how to use your declination value. Now that you know your declination factor, click here to see all our compasses with adjustable declination. OPTION B While Option A (above) is definately the best way to get the most accurate declination value, you can get a quick approximation by looking at the map below. 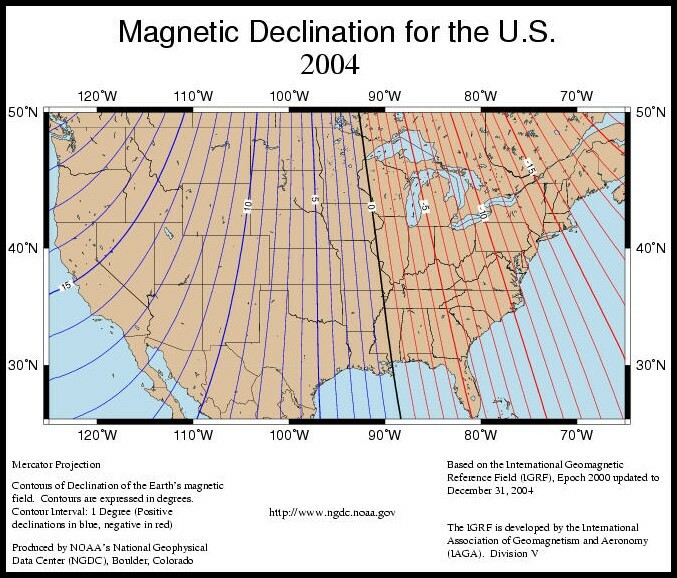 This is a 2004 declination map, and while it is true the declination values change slightly each year, the current map will look no different than this 2004 map because the annual change is so slight it would not be reflected on a map of this resolution.